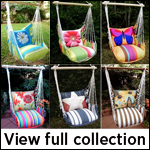 Most of our hammock chair swing sets are full of bright colors, but we understand that some customers need something simple and discrete for their homes and gardens. Our gray fabric chairs give you all the joys of relaxation from all our other hammock chair swings sets. Simple and wonderful, select a decorative accent pillow for added style.